A daredevil will soon attempt to break the world record for the highest skydive—set 50 years ago—and be the first human to freefall faster than the speed of sound, and from near the edge of space. Austrian skydiver Felix Baumgartner is slated to attempt a jump from some 120,000 feet above the ground later this year. 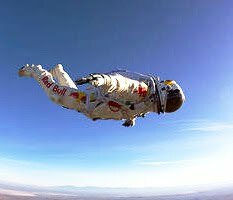 To attain this stratospheric height, Baumgartner will take a three-hour trip in a pressurized capsule raised aloft by a giant helium balloon. The record-setting skydive should help inform escape plans for astronauts and space tourists alike by extending the "safety zone" where making a bailout is still in the cards.